A few weeks ago on February 29, New York City’s exclusive Players Club opened its doors to one of their own, member Michael Riedel – the weekly theatre columnist for the New York Post and author of Razzle Dazzle: The Battle for Broadway, an in-depth look at the power players behind the scenes who fought for the soul of Broadway from the 1960s up through the 80s and 90s and oversaw the shift of Broadway from the days of “ice” – profits skimmed off the top of the box office gross to grease the palms of Broadway employees on all levels – to the dawn of the Disney era on Broadway and the cleaning-up of Times Square, a former den of iniquity that now shines like the top of the Chrysler Building. The Club itself is steeped in rich New York history. Founded by Edwin Booth (John Wilkes’s brother) in 1888, its clubhouse on the south side of Gramercy Park is a beautiful 19th Century Gothic Revival-style mansion, the interior of which is just as stunning. Revelers at Riedel’s soiree rubbed elbows in close proximity to stunning portraits of Christopher Plummer as Prospero in The Tempest and Katherine Hepburn, just a few of the scores of theatre luminaries who’ve counted themselves among the Players’ members. 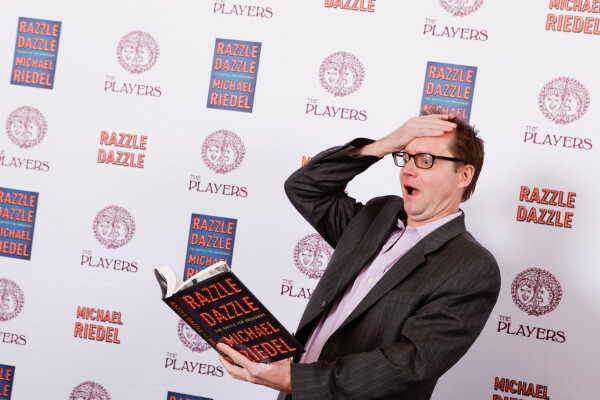 The main focus, though, was on Riedel, who sat down with Exeunt to talk about Razzle Dazzle, which was released last October and has, in the interim, enjoyed praise from critics and remained at or near the top of Amazon’s bestseller lists in its theatre categories. Since he’s a theatre columnist by day, or, well, the theatre columnist, self-describing his weekly dispatches as “snarky and sarcastic and sneering and preening and full of silly jokes,” I asked him if it was difficult to find the right tone for a longer piece of writing. It’s clear that Riedel has a deep interest in theatre – you have to in order to write a book about the art form, but I asked him if it’s possible to be a real fan and still do the work he does. “I think the kind of writing that I do, which keeps the theatre a bit at arms length, and writes with affection but with skepticism, it’s best not to be a big, big fan,” he said, “and I was not a theatre kid growing up. I was going to be a lawyer, and I had no interest in journalism either, but I wound up in this wacky business. His bold assertion is a little hard to believe however, even if his empathy may not manifest itself often in his day-to-day work, which often infuriates his subjects – he’s known for a tiff with Harvey Weinstein over the fate of Finding Neverland and earning the creative team’s ire during the run of 2003’s Gypsy revival with Bernadette Peters, among many other spats. 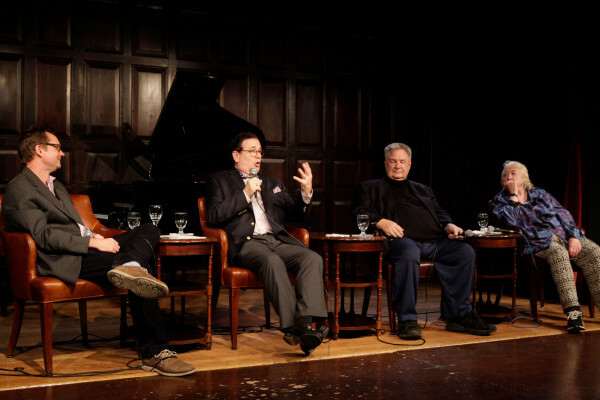 After cocktail hour ended, Riedel sat down in the clubhouse’s dining room with producer Liz McCann (known for producing Edward Albee’s plays), general manager Albert Poland, and actor Lee Roy Reams (who starred in the original production of 42nd Street). The foursome reminisced about the old days, recounting stories of the Shuberts and Nederlanders before shifting into somewhat darker waters, recounting the final years of legendary director-choreographer Michael Bennett (A Chorus Line) and the onset of the AIDS crisis. It’s a time that fascinates Riedel. Not only did he cover the onset of the AIDS crisis in Razzle Dazzle. If he has his way, he’ll have a chance to tackle that era again – not just the 80s and the rise of AIDS, but the era of hedonism that came before. Though there’s talk (only rumblings at this point) of a sequel to Razzle Dazzle, Riedel has his eye on another subject as well. Riedel told me, “I’m particularly interested in Robert Stigwood, the Australian impresario who created Andrew Lloyd Webber and Tim Rice and Jesus Christ Superstar and Evita and then did Eric Clapton in Cream and created the Beegees and produced Saturday Night Fever and John Travolta and Grease and then just disappeared. He died just last month. I was always fascinated by him, because I wanted to tell a story of 70s popular culture, and he was the great producer of that era, but he in the end was brought down by the hedonism of that era. I’m quite interested in the 70s scene in New York City and Los Angeles and London, when almost anything you wanted to do you could do, because there was no knowledge, no fear, of this thing that would bring everybody down called AIDS. So I’m interested in popular culture before the AIDS crisis.” Here’s hoping Riedel has a chance to tackle Stigwood’s story as well.